Will Middlebrooks connects for his first Major League home run (a 5th inning grand-slam this afternoon). Well we’ve reached another Sunday night, and the Red Sox are still at the basement of the AL East Standings. At 11-16 overall there are only two American League teams worse than Boston (Kansas City Royals 9-18, Minnesota Twins 7-20) so to say that there is some panic in Red Sox Nation would be an understatement. After what looked like an encouraging week where the Sox won 6 of 7 two weeks ago, this past week the Sox took two giant steps backwards losing 2 out of 3 to the Oakland Athletics and getting swept this weekend by the Baltimore Orioles. Over the course of the 162 game marathon every team will drop a series or two that they probably should have taken care of, but losing to the Athletics and then following it up getting swept by Baltimore is just totally unacceptable. There should be a lot of people both in the clubhouse and in the front office taking a good, hard look at why this team is faltering and not playing anywhere near the expectations on them and hopefully they will be able to figure it out before it’s too late. With the exception of Monday night’s game the bats were way too quiet this week. You can’t expect to get anywhere near double digit production every night, but in the same token making Oakland’s pitchers look like All-Stars shouldn’t be happening either. And then to continue that trend over the weekend, scoring just 12 runs in 39 innings against the Orioles is just not getting it done. A big reason for the struggles offensively this week has been the lack of production from first-baseman Adrian Gonzalez. Gonzalez hit .207 on the week, but had only one extra base hit and zero RBI’s. He also took responsibility for the Wednesday night loss stating “this game is all on me…I had two great opportunities and I didn’t come through. It was one of those things. I’ll make a definite point to not let that happen [again]”. The Red Sox need Gonzalez to drive in runs and get on base, and this was a rough week for him. He wasn’t alone though, as surprisingly the Sox hitter who was responsible for the most runs this week was short-stop Mike Aviles who despite going 7-32 on the week (good for a .219 average) led the team with 6 RBIs and also his 4 runs scored. You know your team is in trouble when a guy batting barely over the Mendoza line is leading the group in run production for the week, and that was the case for the Sox this week. Rookie Will Middlebrooks made his MLB debut this weekend and went 2-3 with a walk and a stolen base on Friday and connected for his first ML home run (a grand slam in the 5th inning today), so his powerful bat could be the spark that this team needs to get headed back in the right direction. The best start of the week went to left-hander Jon Lester who went 6 innings allowing 3 earned runs on 5 hits on Friday night against Baltimore. You have to get more out of your starting pitchers, and this week they failed to deliver. Clay Buchholz is one of the culprits bringing down this pitching staff so far, as he allowed 11 runs over 10 1/3 innings this week and couldn’t make it out of the fourth inning today. Unfortunately for Clay he wasn’t able to make it out of the 7thinning in his Monday night start as former teammate Josh Reddick took him deep to hurt Clay’s stats even more. Buchholz admitted that he’s given up too many runs and that he’s lucky the offense has been providing for him, because there is no way he should have that 3-1 record next to him his name sporting a 9.09 ERA. The only reason I am giving the Sox a passing grade for pitching this week is the surprisingly quality results out of the bullpen this week. “Every day” Scotty Atchison made 5 appearances this week for the Sox and did not allow a run over 6 1/3 innings and is probably the biggest bright spot for the team this week. Matt Albers also only allowed one hit over the 6 innings that he worked, and closer Alfredo Aceves added 3 2/3 scoreless frames for the team (though not in any save situations unfortunately). The Red Sox need to find some stability in the starting rotation, and until then it will be a rocky road with more weeks like this one than excellent weeks like the one before it. 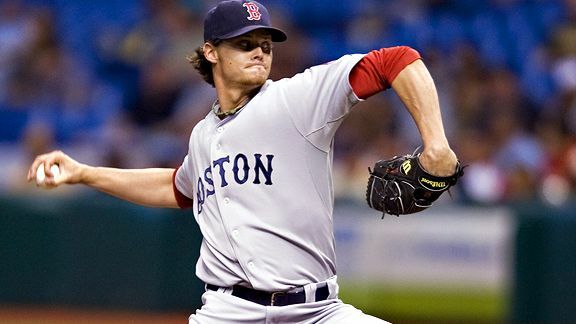 Clay Buchholz needs to figure out why he has a 9.09 ERA this season and fix it. The Sox are still holding strong in team defense, in a tie for second with the Texas Rangers at a .989 fielding percentage. I would give the team an A, but the catching position leaves something to be desired defensively. The Red Sox are tied with the Pittsburgh Pirates for least runners caught stealing (3 on the year) and second to the Seattle Mariners with 5 passed balls on the year. Today Jarrod Saltalamacchia had a rough day behind the dish, misplaying a foul popup and then throwing the ball into center field trying to catch a runner stealing second. The catching position is the most difficult one to play defensively and catchers typically only get noticed when they throw out a runner or when they make errors, and unfortunately today Salty was exposed for the latter. The Sox are lucky in that what they needed after this week was to get away and clear their heads a little. Being around the negative energy on sports talk radio and the local cable television shows won’t help the team out, but luckily they are already at their next destination in Kansas City, Missouri. The Sox will play a three game set at Kauffman Stadium beginning tomorrow, and then they will continue the road trip with a 4 game series in Cleveland against the Indians Thursday-Sunday. I’m not going to make any predictions about the week ahead, thanks to the Orioles proving me wrong and remaining a half-game up in the AL East with their win today and the Tampa Rays being defeated by Oakland, but I will just say that I’ll sleep a lot easier this week if this ship gets turned around. This entry was posted in MLB and tagged Baseball, MLB, Red Sox, Sports. Bookmark the permalink.